Our club was founded in May of 2002. It is one of several clubs based in the Denver Metro area and the first club in Aurora. The club was founded by the co-leaders Bill and Caroline Wriston and Laura Carpenter. Two other families joined the leaders for a total of four guide dog puppies. The club now has over 20 families and 12 guide dog puppies. Liberty on Leashes has raised over 100 puppies for Guide Dogs for the Blind. Puppy raising volunteer families receive a 2 month old puppy to love, care-for, and train for about a year. 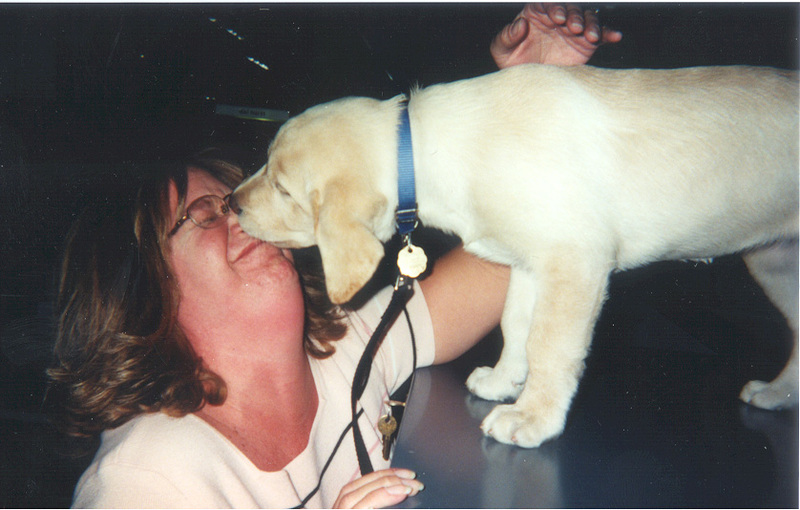 Puppies follow their raisers to all kinds of events, such as; work, school, malls, restaurants, and theatres. Guide dogs for the blind has been breeding their own dogs for over sixty years. They use pure bred Labrador Retrievers, Golden Retrievers. Additionally, you may see crosses between Labrador and Golden Retrievers. The puppies are bred in San Rafael, California, and are delivered to Denver in a specially equipped van. After we have the puppies for about a year they go off to puppy college in San Rafael California or Boring Oregan for about 2-3 months of final training and then attend class with their blind person before graduation and starting their working career. A puppy club is made up of loving, caring individuals that are always there for each other whether its training advice, puppy sitting, an ear to listen or a shoulder to cry on. To contact Bill or Caroline for more info call 303-627-1383 and we will answer your questions. All the puppy club people are volunteers but we get paid a million bucks in puppy kisses!!!!!! !